BROTHER voted best printer 9 years in a row. With our work shop based in Ballito we of compuiter repairs, as well as printer, laptop and point of sale repairs. We collect and deliver at no charge to our corporate, retail, and hospitality clients. Regular clients also do not pay a quote rejection fee. With over 20 years experience and a solid track record we assist original manufactures, IT distributors and software companies with maintenance on their equipment. Our technicians are friendly fast and reliable. Our on site maintenance team for printer and scanner related problems can either repair on site or uplift the machine where it is taken to our lab for assessment. All repairs not under service level agreements will be quoted on before any work commences. We supply and replace individual parts like rollers, separation pads and automatic document feeders or complete maintenance kits. OEM or generic parts are available for all makes and models of printers. Drive gear assembly’s for dot matrix printers like Epson, OKI and brother can be replaced and supplied. CRS is also a supplier of thermal and dot matrix heads for various point of sale, warehousing and report printers. We supply and replace refurbished or new original heads for OKI, Zebra label printers, Samsung, Epson, and brother printers. Feed rollers, separation pads and automatic document feeders on laser printers should be replaced regularly to keep the printer printing optimally. Restaurant, Hotel and Entertainment establishments that most likely have Epson, Seawoo and Zebra point of sale printers installed should make it a habit to service these printers during the slow season. It is of utmost importance to clean and lubricate slip and dot matrix printers especially on the East coast. The humidity effects the rollers, heads and shafts of these high impact printers. This will improve the up time for your restaurant or Bar especially during busy seasons when the demand on the slip printers are high. CRS maintains and supplies various scanners for various sectors of industry. The normal A4 or A3 flatbed scanner or ADF installed on a laser printer or multi functional machine seldom gives problems, but should our corporate clients require the ADF feed rollers and separation pad be replaced we can do it on site. Complete OEM ADF and flatbed assemblies can also be swapped out on the bigger high volume printing machines. For our clients that run a paperless system we offer high volume Avision scanners. We are also the official service agents for Avision in Kwazulu Natal. As with Laser, dot matrix and slip printers it is paramount to replace the rollers, separation pads and lubricate the shafts on a regular basis. If you are a new client and would like to go paperless contact us today for a quote on these high speed A4 scanners. Honeywell, Symbol, Riotek, Posiflex are all popular handheld scanners used in the retail and medical industries. Although mostly cable problems the root cause associated with these hand held scanners we supply and maintain them. 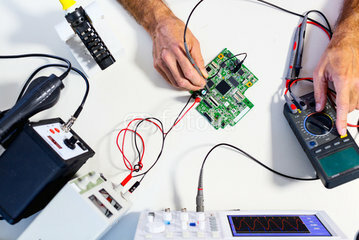 Even the Cipherlabs hand held computers can be repaired at reasonable rates. Should you only require cables please don’t hesitate to contact us. Point of sale touch screens and all-in-on units. CRS computer repair services is the Hi Sense and Toshiba warranty repair center on all their point of sale repairs. Specializing in point of sale repairs for the past 15 years we replace broken LCD’s, cracked touch panels and faulty main boards. We are suppliers of various all on one touch screen units and stand alone touch screens with industrial computers. CRS supplies and replace laptop or notebook batteries for Toshiba, Acer, HP, Lenovo, IBM, Asus, Mecer and many more. If it is a power supply you require for your laptop please mail us the model and make. Cracked LCDs, failed harddrives data recovery are all part of the turnkey solution we offer our clients. End of life and hard to get spares can also be sourced from our suppliers overseas. We can supply and reload Microsoft Windows and Microsoft office. If your computer is running slow we can clean it up. We have collection and delivery daily from Ballito, Umchlanga, Durban North, Durban central , Pinetown, Westville, New Germany. With over 20 years experience we can repair down to board level. We have a carry-in center where you are welcome to bring your faulty equipment for evaluation. We also offer an on-site repair and maintenance service.